Hellenistic age bronze statues images collections from greek museums. Hellenistic Age Bronze Statues - images collection from greek museums Each thumbnail photo is a link to a larger version of the same photograph. Bronze statue of a horse and a young jockey. Retrieved in pieces from the shipwreck of Cape Artemision in Euboea. The work is known as the "Artemision jockey". The group was reassembled in 1971, with the financial support of an American lady and the Psichas Foundation. About 140 BC. Bronze portrait head. Found in the Lake Palaestra,Delos. The modelling of the flesh in many planes attests to a great sculptor, whose work expresses the characteristic psychological realism of the Late Hellenistic Period. Early 1st c. BC. National Archaeological Museum of Athens. Left arm of a larger than life-size statue of a young boxer. The arm was cast separately from the rest of the statue. The athlete wears the so-called sharp thongs; these were strips of leather that were wound around the wrist and protected the back of the hand. 2nd c BC. National Archaeological Museum of Athens. Statuette of Athena on a circular base. The goddess wears a heavy tunic (peplos) forming an overfold and the goatskin with the Gorgon's head on the bosom. The figure has a helmet of attic type on the head. The left hand would rest on a spear. 1st c. BC. National Archaeological Museum of Athens. Statuette of a female figure, probably Aphrodite seated on a rock. The figure wears a mantle (himation) covering the lower part of the torso. The type is known from Rhodes in the end of 2nd c. BC. and was imitated in later times too. National Archaeological Museum of Athens. Sword in the scabbard,part of a statue. The hilt and the scabbard bear incised decoration. The type was widespread particularly in the Hellenistic period. 200-150 BC. National Archaeological Museum of Athens. Portrait head from a statue of a philosopher. Bronze. Found in the Antikythera shipwreck. 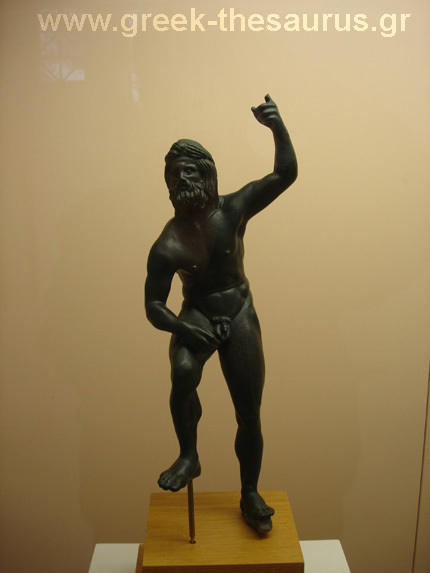 The philosopher was depicted standing, wearing a long himation. In his left hand he held a staff, and the right was extended in a characteristic gesture of orators. He wears sandals with thick soles. 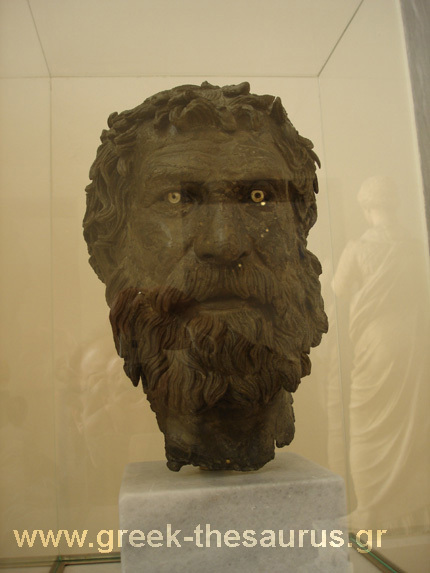 This statue depicted a cynic philosopher probably Bion the Borysthenite. About 240 BC. Bronze statue of Poseidon. From Pella. Late Hellenistic period. Bronze head of a boy. Late 2nd c. BC. Olympia Archaeological Museum. 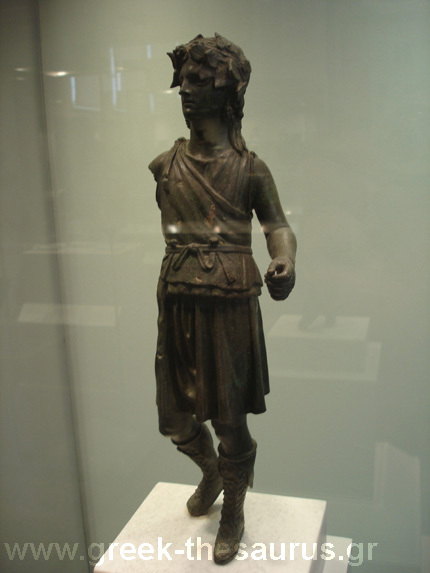 Bronze statue of Apollo. The hair, held in place by a fillet, is drawn back into a chgnon at the nape, forming free locks on the back and shoulders. 1st cent. BC. 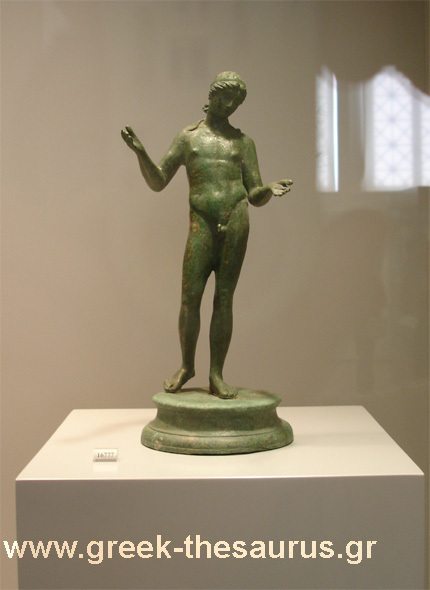 Bronze statue of Dionysos. The God beardless, is represented as if walking. He wears a short light chiton, a fawnskin and boots. On the head is an ivy wreath and bunches of grapes hang either side of the face. He would hold a wand wreathed in ivy-and vine- leaves with a pine cone at the top in the right hand and a drinking cup (kantharos) in the left. About 2nd c. BC. Chochlia , Eurytania.